The iPhone 4/4S/5 supports you in daily life, professional and private, in the car, at the desk or during the fitness training. And in this process, the applications are as manifold as your life: the iPhone 4/4S/5 navigates you to your destination, keeps you informed on the weather or the current sales figures and supports you during cooking. Because the better the display is visible, the more comfortable is navigation – particularly also in curves. Using xMount holders, your iPhone 4/4S/5 always has the best place – wherever you use it. Because for your iPhone 4/4S/5 being ideally applicable everywhere, xMount produces unique holders: for the car, wall and table mountings, shapely floor stands or anti-theft protections. You require an advice during cooking? Super if you are not required to look for your iPhone 4/4S/5 between a wooden spoon and wooden board now. And on fairs or in the showroom the iPhone 4/4S/5 impressively – and securely in place – shows everything important without you having to be present all the time. xMount. One holder, infinite possibilities. xMount is an intelligent system of different holders having particularly developed for the iPhone 4/4S/5. 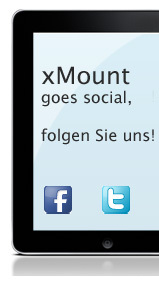 xMount increases the usability of your iPhone 4/4S/5 and so the pleasure you will have with it.